Maritzburg continued their outstanding form in the MultiChoice Diski Challenge by beating Free State Stars 3-1 at the Harry Gwala Stadium. The Team of Choice drew first blood when Mohammed Anas netted on 23 minutes. 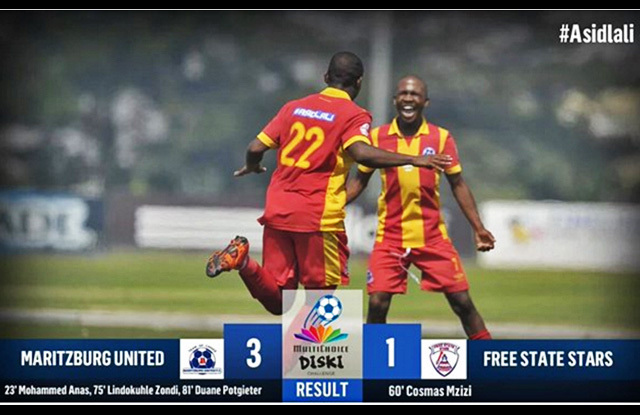 Stars were on level terms in the 60th minute through a Cosmas Mzizi goal, but the Team of Choice were in uncompromising mood as they hit back with two goals in six minutes, Lindokuhle Zondi’s 75th minute effort putting them back in front before Duane Potgieter made sure of the points with an 81st minute strike. The result leaves Maritzburg on 23 points from 11 games, Sundowns sitting top with 27 points from 12 matches. Maritzburg continued their outstanding form in the MultiChoice Diski Challenge by beating Free State Stars 3-2 at the Harry Gwala Stadium.